Bones: The wrist, technically the carpus, consists of eight small bones which lie between the forearm bones and the hand. They are shaped like little irregular blocks, by contrast with the longer lines of the ulna and radius in the forearm and the metacarpal bones which form the fleshy part of the hand. On the thumb side of your wrist, you can use your other hand to feel the pointed end of the radius, technically the styloid process. To feel the trapezium, press your thumb and index finger tips together, and place the fingers of your other hand on either side of the bone just before the first metacarpal and below the end of the radius. By moving your fingers up the forearm a little, you can then feel the scaphoid. On the little finger side, you can see and feel the head of the ulna on the back of the wrist, and you can feel the prominent knob of the little pisiform bone on the front, or palm side. The other bones of the carpus, which are more difficult to feel from the surface, are the lunate, next to the scaphoid, the triquetral next to the lunate, the pisiform which lies closer to the skin surface over the triquetral, the hamate between the triquetral and the fifth metacarpal (little finger side), the capitate in the centre, roughly at the end of the third and fourth metacarpals, and the trapezoid between the capitate and the trapezium, at the wrist end of the second metacarpal. The small bones of the carpus are arranged in two rows: the scaphoid, lunate, triquetral and pisiform form the proximal row, butting on to the forearm bones, while the distal row consists of the trapezium, trapezoid, capitate and hamate, which link to the metacarpal bones leading into the thumb and fingers. The hand consists of five metacarpal bones, and fourteen finger bones or phalanges. The thumb consists of two finger bones, while the four fingers have three each. The bones are numbered from the thumb side, so the first metacarpal leads to the thumb, the second to the index finger, the third to the middle finger, the fourth to the ring finger and the fifth to the little finger. It is relatively easy to feel the lines and expanded ends of the metacarpals and the phalanges, but if the hand is very fleshy you may need to press quite hard. The knuckles on the back of your hand are the rounded expanded ends of the metacarpal bones. Joints: All the bones of the wrist and hand are interlinked in a complex series of joints bound by ligaments, muscles and tendons, encased in enclosing capsules lined with synovial membranes, and lubricated by synovial fluid produced by the synovial membranes. The main wrist joint is formed between the end of the radius (outer forearm bone) and the scaphoid, lunate and triquetral, and is termed the radiocarpal joint. The lower ends of the radius and ulna are bound by a fibrocartilaginous articular disc, which forms an integral part of the wrist joint. The links between the carpal bones are called intercarpal joints, and those formed between the distal row of carpals and the metacarpals are the carpometacarpal (CMC) joints. The first carpometacarpal joint, at the wrist leading to the thumb, is a saddle (sellar) joint, and is more complicated than the others. The metacarpophalangeal (MCP) joints link the palm of the hand to the fingers. In the fingers, the proximal interphalangeal (PIP) joints form the first line of joints, while the second line, to the fingertips, consists of the distal interphalangeal (DIP) joints. Muscles and tendons: The main muscles and tendons which control the wrist extend from the elbow into the hand, with some reaching almost to the ends of the fingers. The hand is controlled by those long muscles which are attached to the various hand bones, and by small muscles called the intrinsics which lie in between the hand bones. Where tendons cross over each other or other tissues, they are often enclosed in synovial sheaths which provide protection and lubrication for frictionless movement. The superficial muscles are closest to the surface of the skin. They are the ones you can see most easily in action, as their tendons stand out under the skin when you contract the muscles. Those which bend the wrist so that the hand comes closer to the arm are the flexors: flexor carpi radialis, palmaris longus, flexor carpi ulnaris and flexor digitorum superficialis. They are attached at their upper end mainly to the common flexor tendon at the inner side of the elbow, technically the medial epicondyle of the humerus. This is where so-called “golfer’s elbow” occurs. The superficial muscles which bend the wrist backwards are the extensors: extensor carpi radialis longus, extensor carpi radialis brevis, extensor digitorum, extensor digiti minimi and extensor carpi ulnaris. These arise mainly from the common extensor tendon on the outer side of the elbow (lateral epicondyle of the humerus), where the injury known as “tennis elbow” can happen. Underneath the superficial layer are muscles which lie more deeply in the forearm. 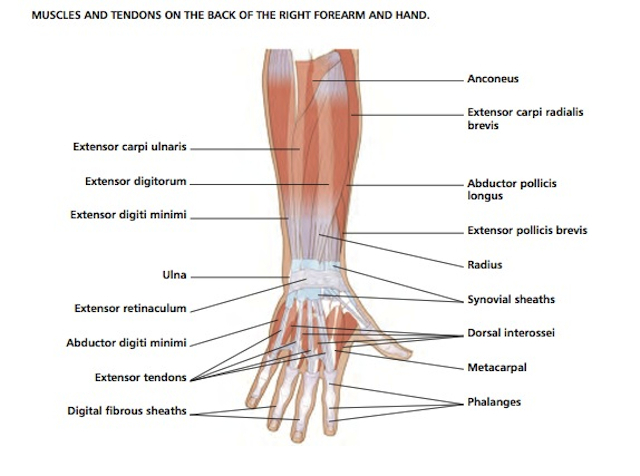 These include flexor digitorum profundus and flexor pollicis longus on the front of the forearm, and abductor pollicis longus, extensor pollicis longus, extensor pollicis brevis and extensor indicis on the back. 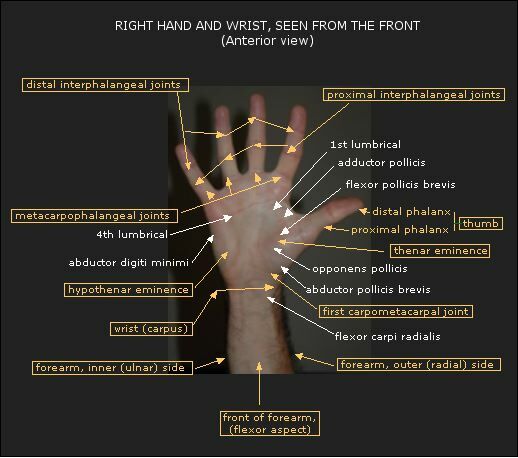 Some of the intrinsic muscles of the hand form the raised pads on either side of the palm, called the thenar eminence on the thumb side, and the hypothenar eminence on the little finger side. 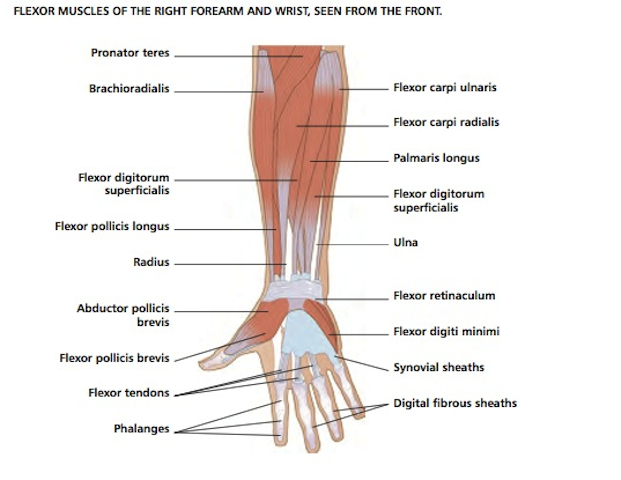 The thenar muscles consist of abductor pollicis brevis, opponens pollicis and flexor pollicis, while the hypothenar eminence comprises palmaris brevis, abductor digiti minimi, flexor digiti minimi brevis and opponens digiti minimi. The other intrinsics, which connect the metacarpals to the thumb and fingers are the adductor pollicis, the palmar and dorsal interossei and the lumbricals. Functions: Because the thumb can move across the palm of the hand, we can grip objects safely and firmly with the whole hand or in a pincer between the thumb and a finger. 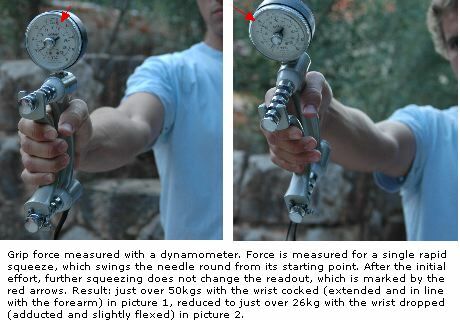 Grip is strongest when the wrist is cocked, that is when it is extended, and held in line with the forearm. The wrist and hand co-ordinate with the forearm, elbow, arm and shoulder, making it possible to do a wide variety of complex tasks in different positions. We can scratch our own back, and tie apron-strings or do up zips and buttons behind us. We can perform delicate movements like writing, typing, painting, sewing, playing an instrument, playing darts. The hands, wrists and arms can develop special strength for handstands and other gymnastic manoeuvres, rope-climbing, rock-climbing, archery, racket sports, and sports involving throwing or punching. Our hands are very sensitive. Normal hand function depends on the nerves and circulatory system working efficiently, so that we can feel what we are doing and touching: these are internal and external mechanisms, involving proprioceptive nerves, which tell us what our joints and muscles are doing and where they are in space, and sensory nerves which provide feelings such as hot, cold, hard, soft, sharp, rough or smooth. Therapists who use their hands for treatment and healing, for instance massage, manipulation, or movement-based manual handling techniques, develop the sensitivity of their touch. This is a two-way process: the therapist becomes increasingly aware of the patient’s tissues and their state, while the patient may feel the energy emanating from the therapist’s hands, often in the form of heat. Wrist movements: The radiocarpal, intercarpal and carpometacarpal joints all work together when we perform wrist movements. The wrist can bend, bringing the palm of the hand towards the forearm. Against the normal resistance of gravity, the superficial flexors of the forearm act concentrically to perform the movement, helped by the deep flexor muscles, which join in strongly if there is strong opposing resistance or a heavy weight to move. The opposite movement of extension, or bending backwards, is performed by the superficial extensor muscles acting concentrically against gravity, helped by the deep extensors. The wrist can also bend sideways. This is called adduction or ulnar deviation when the movement is towards the little finger side of the hand, and abduction or radial deviation when done towards the thumb side. Adduction is performed by flexor and extensor carpi ulnaris. Abduction is much more limited in range, but is performed by a number of muscles: flexor carpi radialis, the extensors carpi radialis longus and brevis, helped by abductor pollicis longus and extensor pollicis brevis. Circling the wrist in either direction involves combining the bending and extending movements, so that all the muscle groups work in turn. Finger movements: The metacarpophalangeal joints which join the palm and dorsum of the hand to the fingers also perform the movements of flexion, extension, adduction and abduction, but with much less freedom. Flexion of the second to fifth metacarpophalangeal joints allows the greatest range, of about 90 degrees. The small intrinsic muscles of the hand play a special part in hand-finger movements: the movement of cupping the hands, keeping the fingers straight, is diminished if the intrinsics are weak. 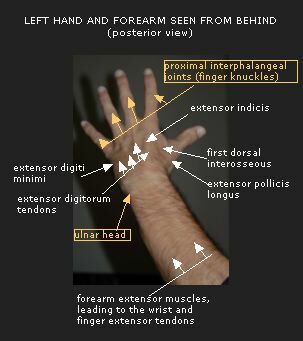 The lumbricals and interossei take a lead part in flexing the MCP joints; the palmar interossei adduct the fingers, bringing them towards the middle finger when the fingers are held straight or extended (bent backwards from the MCP joints); the dorsal interossei abduct the fingers, moving them away from the middle finger. The finger joints (PIP and DIP) bend (flex), bringing the fingers towards the palm of the hand. This movement is performed mainly by the long flexor muscles. The lumbricals and interossei are important for the opposite movement of straightening the finger joints, helped by the finger extensor muscles. The thumb, technically called the pollex, moves across the palm mainly through the action of the opponens pollicis and flexor pollicis brevis muscles, which may be reinforced by adductor pollicis and flexor pollicis longus when greater force is needed. When the thumb moves outwards away from the hand, the abductors, pollicis brevis and longus performs the movement, while adductor pollicis brings the thumb back to the hand. To bend (flex) the thumb we use flexor pollicis brevis and opponens pollicis, together with flexor pollicis longus if the thumb’s MCP and IP joints are also flexed, while extending the thumb involves abductor pollicis longus and the extensors pollicis longus and brevis.